In this post, I'll be reviewing the best soundproof earmuffs available on the market. I'll also walk you through the parameters that can influence the buying decision. There can be numerous reasons to look for soundproof earmuffs. My wife used to snore a lot, so I had to find a cost-effective solution to it. Consider yourself lucky if your partner doesn't snore. But snoring isn't the only reason that people are searching for earmuffs. Staying near the traffic zone such as railway stations and airports can be another reason. While I was doing some online research, I landed on an article saying that 1 in 3 Americans don't get adequate sleep. It's a big issue. Lack of sleep can give birth to various physical and mental diseases. You may develop diseases such as Diabetes and High Blood Pressure. On the psychological front, you may develop stress and depression. So, sound sleep is very important to keep yourself fit. 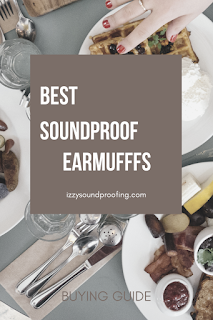 Earmuffs can be used for various purposes, but in this post, I'll only discuss the best soundproof earmuffs for sleeping. While I was looking for an earmuff, I found it difficult to find one that could make my ear comfortable. Unfortunately, most of the manufacturers are busy in enhancing shooting range and negating noisy construction. Most manufacturers are making earmuffs for the industrial environment because people prefer white noise machine or white noise fan for the sleeping purpose. However, there are few earmuffs that are created for the sleeping purpose. I've checked the performance of shortlisted earmuffs on certain parameters and selected top 4 that performed above average on these parameters. Before I dive deep into the product review, allow me to take some frequently asked questions that my readers have asked me. As a soundproof consultant, it's my responsibility to help my readers and clients in the best possible manner. Well, all the earmuffs aren't designed to block sound. However, all the earmuffs that I'll be discussing with you later in this post definitely block sound to a certain extent. NRR is abbreviated as Noise Reduction Rating. It ranges between 10 and 31, the highest being better. If you're hearing the word NRR for the first time, then let me tell you, it is a scale used to measure the noise reduction capability of a device. The rule of the jungle is quite simple: The higher the NRR rating the better the earmuffs performance. So, even though you're new to the soundproofing, you can easily know that out of several earmuffs available on the market which are the good ones. Ear Muffs vs Ear Plugs: Which one is a better option? This is the most common question asked by the clients. Earplugs are slightly better at noise reduction if you're able to plug them correctly inside your ears. The only issue is that it can make you really uncomfortable at times leading to improper sleep. Everyone isn't used to with the earplugs. On the contrary, earmuffs have gained popularity in recent years because of the comfort it provides during the sleep. It is placed over the ears, so you'll not find any kind of issue with the compatibility. So, all in all, it totally depends on the buyers' requirement and mindset. Well, initially, I selected 7 noise-canceling earmuffs, but later I thought to reduce it to a minimum to avoid any sort of confusion. It's human nature that the more we have the options the worst we become in taking a decision. Out of all the four, my vote without saying goes to the Blue Hibermate. In short, if I've to pick one out of all, then it would be none other than Blue Hibermate. However, If I just review or promote this single product, then my readers would be asking me so many questions. A few could be related to the alternatives of Blue Hibermate. I've been personally using the Blue Hibermate from quite a few time now. It's literally amazing and if you're a light sleeper, then buying it could be like heating the right cord. It comes with an eye mask which acts as a catalyst and supports you in sleeping better without any distraction. When I've to use any smart devices or anything other devices that will be in touch with my skin, I literally go crazy searching here and there to see where it has a side-effect on my skin. Same holds true with this product. Fortunately, it uses Silicon that is very safe and syncs well with the human skin. I hope you would have experienced a Premium feel if you would have ever any product made of silicon. It goes without saying that the products made of Silicon are comfortable and flexible. Can you guess the noise cancelation level of this product? It has a noise cancelation level of 15-20 dB which means you'll have almost zero noise distraction, and thus, you can expect the final result- a sound sleep. It comes with loads of unique features and benefits. Flexibility- Blue Hibermath is made of medical Silicon which helps in improving the texture and comfortability of the mask. Unlike other earmuffs, which creates some of the other sorts of inconvenience such as ear strains, this product is bound to give you a superlative feeling when you're sleeping. Noise Reduction- Trust me, Noise Reduction is the USP of this product. You'll find people appreciating about this particular feature a lot on the e-commerce websites. It comes with a built-in noise reduction earmuffs which drastically dampen the unwanted noise. A 15-20 dB in noise reduction is a tangible difference. Flexibility in the Context of Sleeping Position- This was one of the features that literally grabbed my eyeballs. Unlike, most of the earmuffs that I've tried in the last couple of years, Blue Hibermath is the one that gives you the unmatchable comfort level while you're traveling. They have a soft cushion over the earmuffs that acts like a sponge when you're sleeping. In short, whether you're a side, back or front sleeper, you'll have a similar level of comfort. Temperature Control- It comes with a breathable material that makes it cool in summer and hot in winter, thus improving the user experience. Still not Convinced or Confused? Well, allow me to take you through the Pros and Cons of this product. Let me know your feedback about this video in the comment section. A million dollar question- What other people think of this product? Well, I believe in the adage- action speaks better than words, so why not to check out yourself rather than hearing from me. In short, value for money soundproof earmuff. An interesting name, isn't it? Contrary to my favorite Blue Hibermate, this is by far the most appreciated earmuffs available on the market. I've seen some of my clients going crazy for this earmuff, especially the ones who are either light sleepers or suffering from stress and anxiety. So, if you've stress related sleepness disorder, then you can try this product. It is perhaps the most user-friendly earmuffs, I've ever come across in my life, you can use it as a neck-pillow while you're traveling. Of course, it goes without saying that they are extremely good at sound blocking. They are also good at blocking the lights, so wherever you're sleeping you'll have a great experience. Before I explore the Pros and Cons, have a quick look at the price on Amazon. Are you surprised by the price? Again, a great competitor of the aforementioned earmuffs. You can't ignore its presence. If the sole reason for lack of sleep is the disturbance caused by the external noise, then without any to and fro, go for the 3M Peltor X-series. If you couldn't buy the Blue Hibermate, just because of the price, then try this product, and you'll never regret investing in it. If you doubt my previous statement, then let me tell you, it has an NRR of 27 which is more than enough to understand the noise deadening capability that 3M Peltor possesses. You'll be astonished to know that it can dampen noise level by 33 dB. On the downside, I feel they have to really work hard to counter the comfort zone that Hibermate and Wrap-a-Nap provides. Anyways, it's a budget earmuff, and so, it goes without saying that it will not be as good as the high-end earmuffs. However, there are a good number of people who prefer budget earmuffs. Are you interested to know the current price of 3M Peltor? REALLY, don't wanna check the price? Let me try to convince you by showcasing the PROS and CONS. The sleep mask blackout is a perfect choice for frequent travelers. I don't know the reason but still, I can say that people love giving this earmuff as a Christmas gift. I also got one on the last Christmas. Maybe, the manufacturers are spending a good amount on an advertisement during Christmas. It is perfect for any mode of travel, be it a car, train or airplane. Even the company portray it as the best earmuffs for travel. The company claims that these earmuffs are made of very unique and high-quality fabrics that keep it warm during the winters and vice-versa. However, if you've long and curly hair, it's better to have cups under your hair for the optimum result. These earmuffs are easily (machine) washable, so you don't have to bother about washing during your travel. Well, if the product interests you, then check the current price on Amazon. I can't ignore the possibility that you didn't like any of these earmuffs. In that case, I would like to walk you through the various parameters that you MUST consider for a smart buying. It is one of the most important factors that may influence a buyer's decision. You're looking for an earmuff that can dampen the unwanted noise, and you can measure the capability of any earmuffs by checking the Noise Reduction Rating. Noise levels are measured in decibels (dB), and so an earmuff with a high dB can be considered better at noise canceling. I would suggest you should go for an earmuff that has 20 or more decibels but less than 85 decibels to have a sound and peaceful sleep. For any product, comfortability can make or break the buying decision. If you're not comfortable with the earmuffs then it doesn't make sense to use it every night even though it has great innovative features. It is advisable to have a clear idea about the materials used in the earmuffs, and also the shape of the earmuffs. I've seen people totally ignoring this feature. Before buying an earmuff, you must check whether it is safe or not. Don't put your safety on the stake. Remember, safety always comes first. It is possible that a product is quite affordable and innovative with great user experience, but lacks a bit on the safety front, I'll never suggest you should take that product home. Just check that the hairband is compatible with you, and the size fits you without any stress or strain on your ears. Especially, if the size is too long, then you'll NOT get the best result. In fact, the sleeping ear defenders wouldn't be very effective because of the gaps between the earmuff and your ears. On the contrary, if the size is too small, then it can cause stress and strain on your ears that can be quite painful at times. Earmuffs come in different shape and size. Select the one that suits your head shape. Also, keep a track of the flexibility quotient. Some of the designs are very unique, and they cover the eyes as well for helping you to get a sound sleep without light and sound. Check for the movement of air. If the earmuffs don't allow proper movement of air, then it is possible that you'll feel suffocation. Even your skin may get irritated if the airflow is not proper. As a soundproof consultant, it is my responsibility that my clients get proper guidance. I ask my clients to compare the price of the products, also read a few reviews before taking a final call on the product. However, there aren't many legitimate customer reviews available on the internet for the earmuffs. So, it is highly recommended to check Amazon for customer reviews. I hope you will find this piece of information helpful. As mentioned earlier also, my vote goes with the Hibermate. Let us know your best soundproof earmuffs for sleeping in the comment section. Please do share this article if you liked the review. Last but not least, the earmuffs are great ways to reduce the distraction during sleep, and thus help your brain to get relax. If you're living a stressful life then its highly recommended to try earmuffs or white noise machine. Are Noise Canceling Headphones Safe?